Bill O’Mara started his legal career in 2008, moving back to his home town of Chesapeake, VA. He has practiced in the field of plaintiffs’ personal injury and other litigation. He has gained extensive court room and trial experience, including contested trials before judges and juries across Hampton Roads. 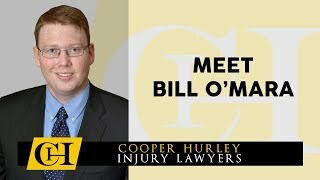 In 2014, Mr. O’Mara joined Cooper Hurley Injury Lawyers as an associate attorney. He became a partner in 2017. He now dedicates his entire practice to helping injured people. He heads up a dedicated premises liability team that helps people injured in slip and fall accidents, trampoline accidents and other accidents at stores, hotels, and restaurants.